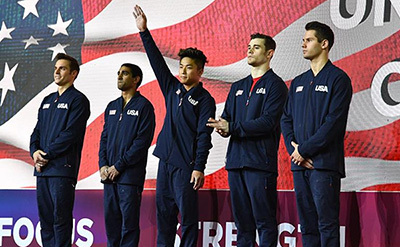 DOHA, Qatar, Oct. 28, 2018 – The USA finished fourth in the men’s team final at the 2018 World Championships in Doha, Qatar, at the Aspire Dome. The women’s team final is Oct. 30 at 4 p.m. Doha time/9 a.m. ET. U.S. fans can watch the finals live at olympicchannel.com and on the Olympic Channel. In the team final, the USA started on pommel horse and competed in the same rotation with Japan. The USA’s 251.994 total was just 1.75 points behind bronze-medalist Japan’s 253.744. China moved into first to take the gold, slipping by Russia, 256.634 to 256.585. The three countries that medaled in the team competition advanced to the 2020 Olympic Games in Tokyo. The men’s team includes Sam Mikulak of Newport Coast, California/U.S. Olympic Training Center; Akash Modi of Morganville, New Jersey/Stanford University; Yul Moldauer of Arvada, Colorado/University of Oklahoma; Colin Van Wicklen of Magnolia, Texas/U.S. Olympic Training Center; and Alec Yoder of Indianapolis/Ohio State University. Allan Bower of Chandler, Arizona/University of Oklahoma, is the alternate. The USA’s team event scores were: floor exercise, 42.966; pommel horse, 40.632; still rings, 41.465; vault, 43.732; parallel bars, 41.699; horizontal bar, 41.500. Three gymnasts competed on each event, with all three scores counted. Mikulak and Moldauer will both compete in the men’s all-around final on Oct. 31. On Nov. 2, Moldauer and Mikulak are in the floor exercise final, with Mikulak also competing in the pommel horse final. On Nov. 3, Mikulak will participate in both the parallel bars and horizontal bar finals. The remaining finals schedule is: Oct. 30, women’s team, 9 a.m. ET; Oct. 31, men’s all-around, 9 a.m. ET; Nov. 1, women’s all-around; Nov. 2, event finals (men – floor exercise, pommel horse, still rings; women – vault, uneven bars), 9 a.m. ET; and Nov. 3, event finals (men – vault, parallel bars, horizontal bar; women – balance beam, floor exercise), 9 a.m. ET. Live scoring is available on the International Gymnastics Federation’s website.